Officially known as the Carciofo Romanesco del Lazio IGP, these artichokes are grown exclusively in Lazio and are the foundation for two of Rome's most historic recipes, both of which date back centuries, if not millennia: Carciofi alla Romana and Carciofi alla Giudìa. 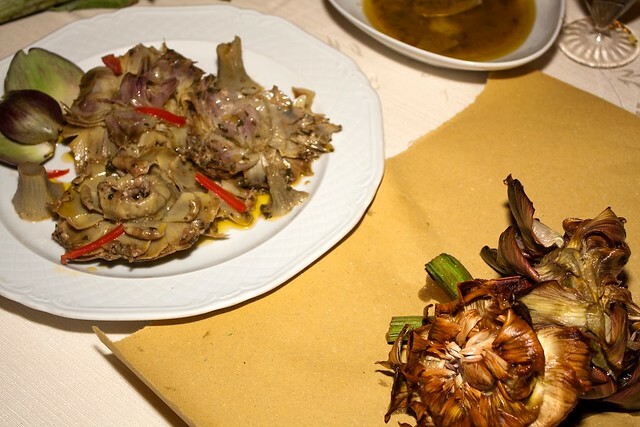 Carciofi alla Romana, or Roman-style artichokes, are whole bulbs, trimmed of the tough outer leaves and most of the stalk (one of the benefits of purchasing them from the market is that the vendor will expertly trim them for you), seasoned with parsley, mint, garlic, salt, and pepper, and slowly braised in water and white wine until deliciously tender. These are a popular side dish in the spring, and often served with roasted lamb on Easter. 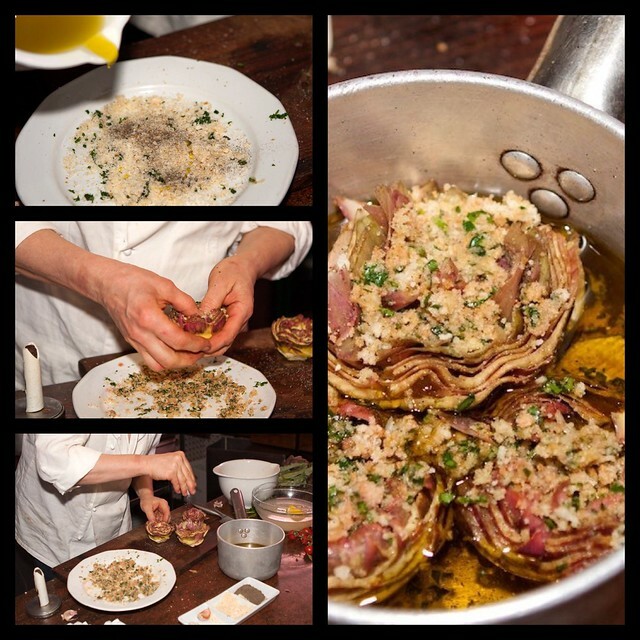 One of our favorites is the slightly modified but memorable version served by Maria Luisa at Villa Roncalli in Foligno. Though Umbrian, Luisa often serves specialties from other Italian regions with her personalized twist, and they never disappoint. Dissolve a tablespoon of flour in a bowl of cold water and lemon juice. Prepare the artichokes by removing the tough outer leaves and trimming the top part. Cut off the stems and reserve. Soak the artichokes in the bowl of cold water until cooking time. On a plate, season the breadcrumbs with salt, pepper, ½ clove of garlic (crushed), the parsley (chopped), and the cherry tomatoes (finely chopped). Remove the artichokes from the water and place them upside down on a tea towel to remove all the water. Open the leaves, season with salt and pepper, and sprinkle with the breadcrumb mixture. In a pan, add the olive oil, water, and remaining ½ clove of garlic. 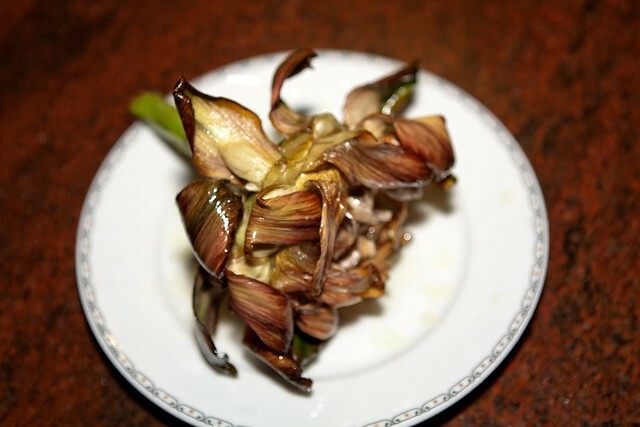 Arrange the artichokes upright in the pan with the reserved stems, sprinkle with the white wine, and cook until tender. Turn the artichokes upside down for the final minutes of cooking. Serve warm or cold accompanied by some sauce from the pan. 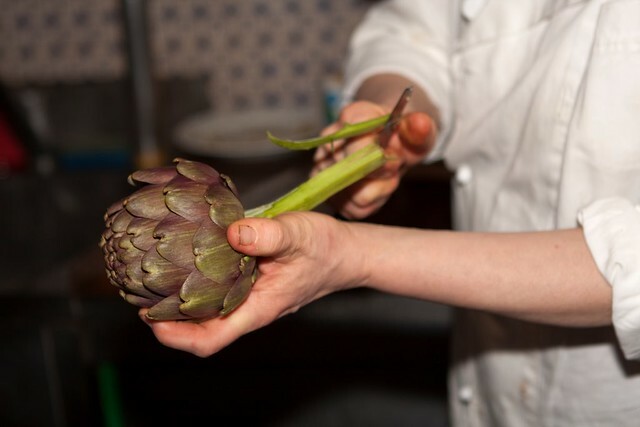 Prepare the artichokes as described above, keeping the stems as long as possible and attached to the bulbs. In this case you may decide not to trim the tips of the leaves, as untrimmed artichokes are more attractive once cooked. In a tall and narrow pan, heat the extra virgin olive oil (or half olive oil and half sunflower oil) with a wine cork (according to Luisa’s mother this prevents the artichokes from tasting “fried”). 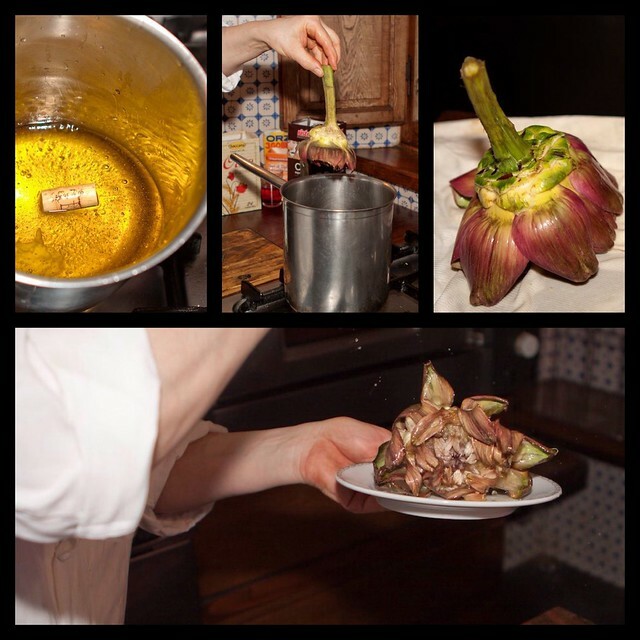 When the oil is warm, dip the artichoke holding it from the stem and pressing it against the bottom of the pan in order to open the leaves. Cook each for about 15 minutes, making sure the oil is not too hot otherwise you may end up with burnt leaves and the artichoke not cooked enough inside. 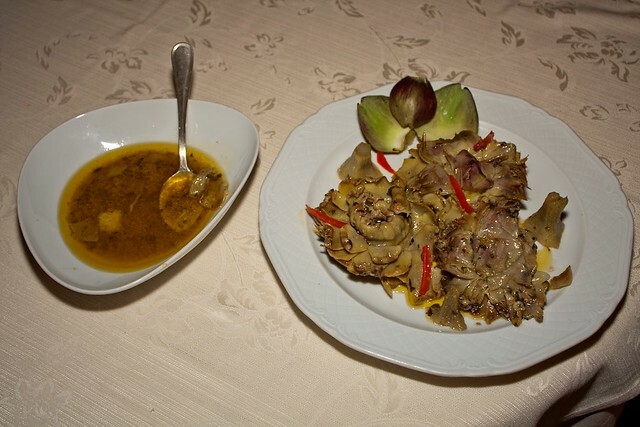 Remove the artichoke from the oil, sprinkle with cold water and put it back in the oil for a few seconds. This will result in extremely crunchy leaves. Tisana (herbal tea): Boil the artichoke leaves for ½ hour, add the peel of one lemon, and leave it to cool. Add a teaspoon of honey to your cup before drinking. This is excellent for the digestion, liver function, and lowering cholesterol. Soup: Prepare a vegetable stock with carrots, celery, onion, the artichoke leaves, and a couple of mushrooms, if desired. Once the vegetables are cooked, strain the stock and add a couple of potatoes. Cook until the potatoes are tender, then mash them with a potato masher. Serve the soup with a drizzle of olive oil and some freshly ground pepper. 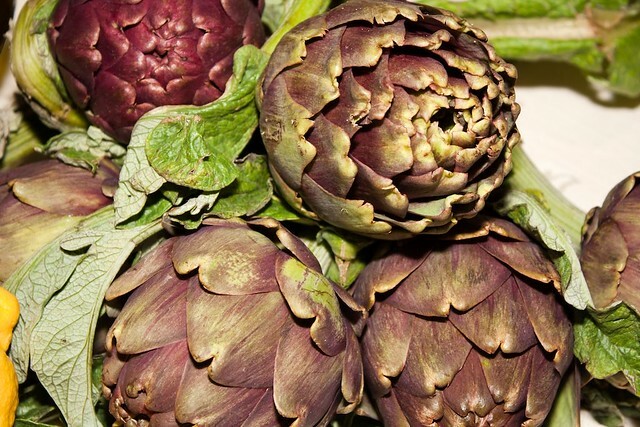 You may also come across decidedly smaller artichokes at the market, with a compact, cone shaped bulb and spiny stems. These are Sardinian artichokes, officially known as Carciofo Spinoso di Sardegna DOP and are wonderful sliced thinly, tossed with shaved parmesan, and eaten raw in a salad.